It's been a while since I've seen some Code Geass, so why not get my dose of the series with this. 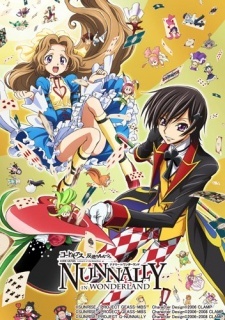 Code Geass: Nunnally in Wonderland is a spin off of the Code Geass series which, as you could tell from the title or image (or both), is a parody of Alice in Wonderland. It's only 30 minutes long however, so expect a concise version of the story with the Code Geass company. Nunnally in Wonderland starts off with siblings Lelouch and Nunnally sitting under a tree. Whilst talking, Nunnally asks Lelouch if he can tell her a story like he used to when they were younger. He reminisces about those days before he "uses" his Geass to order all the characters to be included in the story he's about to tell his dear sister. Nunally is able to see again since she's the main character in his story, and Lelouch begins the story. Lelouch is present 90% of the time, sitting down with a book whilst he's narrating, though he is static most of the time. The story is shown through pictures rather than animation for the majority of the story, but this adds to it in a good way in my opinion. Throughout the story, Lelouch shows his love for Nunnally as she travels through the Wonderland in order to find her way home whilst he is narrating, which is quite adorable as he's just being an older brother who dotes on his little sister. There are also hints a couple of times about what happened in Code Geass R1 and R2 which you wouldn't know of unless you've seen them before you watch this (I highly recommend them). Include other characters from the series who play characters from Alice in Wonderland and you're in for a treat. It's a nice way to end the Code Geass series with some fun and characters with a bubbly addition to their personalities. A recommendation for anyone who's a fan of Code Geass and Alice in Wonderland.